At the northeast tip of the South Island of New Zealand lies a unique patch of land which is known the world over for producing wines of elegance and sophistication. What makes this area so special is the soil, formed over centuries by slow glacial movement, the seriously cool nights, which help the men and women who tend the vineyards produce fruit which capture the unique flavours of the region. All around the world, certain areas are more suited to growing particular grape varieties due to differences in their climate and soil. In France, Bordeaux produces Cabernet Sauvignon and Merlot whilst Burgundy produces Pinot Noir and Chardonnay. While very different, wines from both regions can easily command thousands of dollars per bottle, as they are revered for capturing the �essence� of these grape varieties. It is because of this that Drift wines come from Marlborough, to deliver the best possible wine for you to enjoy. The fruit for Drift wines is selected from specific sites within the Marlborough region which best express the vibrant characters of the area. This selection goes beyond the broader Marlborough area, the Drift team select the best valleys and the best vineyard, from that vineyard the best fruit. Drift also believe in minimal intervention for winemaking to ensure that the wine clearly expresses the unique characters of the fruit. This means that the grapes are chilled and gently crushed, that they only tend to the juices if there's a need to ensure that none of the vibrant characters are lost. The Awatere Valley lies in the south east of the Marlborough region, and is close to the coast. This proximity to the ocean results in the Valley being cooler, drier and windier, and is better suited to grape varieties which benefit from longer ripening periods, such as Sauvignon Blanc and Pinot Gris. The Waihopai Valley is further inland, west of Blenheim and a tributary of the Wairau River. This area can be significantly cooler than other sites due to the cold air which descends from the mountains surrounding the valley resulting in much later ripening of fruit. Fruit for our Pinot Noir is grown in the Waihopai Valley, as it benefits from the richer soils. 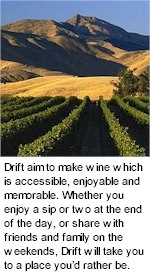 Drift aim to make wine which is accessible, enjoyable and memorable. Whether you enjoy a sip or two at the end of the day, or share with friends and family on the weekends, Drift will take you to a place you�d rather be. To achieve this, the winemaking team at Drift have one simple rule, use fruit from Marlborough which express the vibrant flavours that everyone loves to drink.